Structured data is much easier to analyze and process than unstructured data. This also applies to skills. The classic approach in skills management is therefore to assess employee skills in a skills matrix. This is based on a predefined skill catalog with defined rating scales. While the evaluation of this data is simple, the assessment is laborious. Employees must sort themselves into a predefined grid. 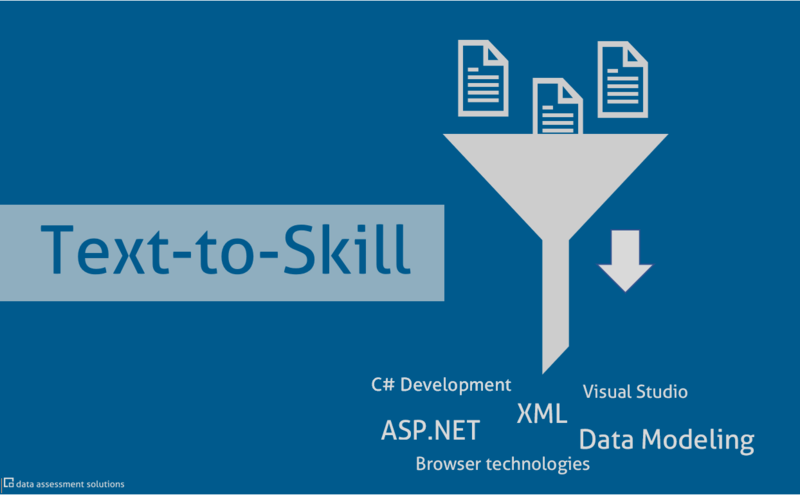 In addition, the skills catalogue must be updated regularly. In practice, both only works with relatively high effort, if at all. With modern machine-learning procedures, we have freed the user in decídalo from the burden of structured data acquisition to a large extent. Here we benefit from the specific characteristics of the consulting industry, our primary customer group. Most consulting companies maintain complete profiles (CVs) of their employees, which contain skill data, project histories and numerous other information, usually as free text. Since consultant CVs are sent to customers, the content is subject to quality assurance. This data is therefore extremely well suited for machine-learning correlations between structured skills and unstructured texts. decídalo learns consultants’ skills from their project histories and other profile texts. This results in much simpler processes for skill and resource management. On the one hand, the consultant no longer needs actively record his skills, but can simply verify or adapt the skills determined by decídalo. On the other hand, customer inquiries no longer must be manually transformed into skill requirements. All you need to do is copy and paste the customer’s e-mail into the search field. decídalo transforms it into a search query for suitable candidates. With the next version of the Text-to-Skill feature, we go one step further. decídalo proposes concrete skills to extend the skills catalog. This largely eliminates the need for our customers to maintain the catalog. The basis for this is a comprehensive knowledge base that we have built up. Since this knowledge base also contains relationships between skills it enables very flexible evaluations and analyses.